You hear us say RVT, but what is a RVT? You hear us say RVT, but what the heck is a RVT? In a veterinary practice, there are many different roles and jobs that are needed to help the clinic function. We have Veterinary Receptionists, Veterinary Assistants, Registered Veterinary Technicians (RVT) and Veterinarians (DVM). Each role plays a crucial part of our team and helps to make our days run smoothly. RVT’s start out as Veterinary Technicians. They have completed post-secondary education and graduated with a diploma to go on to become a RVT. Once graduated the technician must complete and pass the Veterinary Technician National Exam (VTNE) and must also complete a professionalism and ethics course. Once completed and passed, the technician is now a RVT. As a RVT it is mandatory to complete and maintain your qualifications. This is done by completing continuing education each and every year, to ensure that the RVT is keeping up with the ever changing veterinary medicine and techniques. 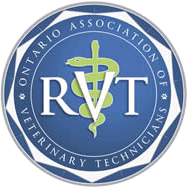 The Ontario Association of Veterinary Technicians (OAVT) monitors the RVT and ensures they are keeping up with their education to maintain their RVT status. The Veterinarian will see the patient in the appointment and get a full history and perform a through physical exam. Next, the Veterinarian will determine what necessary treatment is and present the patient and the treatment plan to the RVT. The RVT will typically see the treatments through. The RVT can do an array of treatments, here are a list of most of them: collect blood and urine samples, wound management, anesthesia, pain management, triage and emergency care, intravenous catheters, urinary catheters, radiographs, pre and post-surgical care, medication administration, nail trims, ear cleaning, cytology (looking at cells under a microscope to help determine diagnosis), urinalysis. This list goes on. This only covers what RVT’s can do for their patients, their role continues for our clients. RVT’s are often first line of communication regarding medical issues and guidance when our clients need help. They are a shoulder to lean on and a valued member of our team. It goes without saying how we cannot function without our RVT’s and we can’t say enough how much we appreciate them. Next time you meet with your RVT, you’ll know you are speaking with a well-educated individual! © 2019 Bloor West Veterinarians in Toronto, Ontario | Bloor Animal Hospital.